is performed by trained personnel of good repute supervised by a regional manager, for orders on a larger scale by a shift leader. The regional manager guarantees the contractual supply of cleaning agents, operating materials, handles staffing and replacements in the case of the absence of workers and performs regular quality inspections and consultations with the customer´s authorized worker. 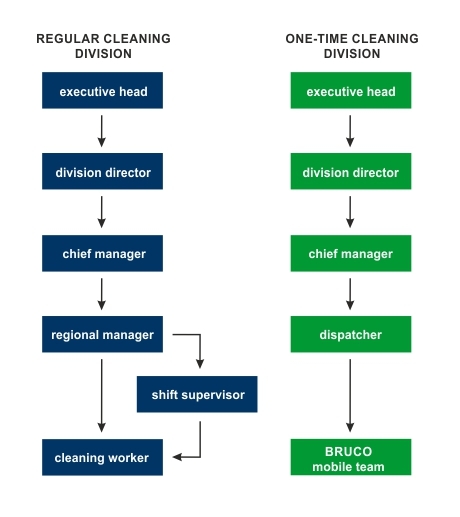 Regional managers of individual branches are supervised by senior managers. is performed by a mobile team of specialized workers supervised by a senior manager directly from our headquarters. The implementation dispatcher ensures contracts on a larger scale.